Have You Hugged Your Pet Hedgehog Today? Hedgehogs, the Latest Pet Craze. Is a hedgehog about to become your new best friend? Yep, there are media reports that hedgehogs are becoming America’s new favorite pets. Sure enough, if one does a regular, non-news, website search; hedgehogs as pets show up all over page one of the search results. Choosing a hedgehog as a pet may not be an easy path. To start with, federal and many state bureaucracies become extremely agitated when it comes to hedgehogs. In some states, it is outright illegal to have a hedgehog as a pet. So, if you decide to engage in this life of crime; do not be surprised if you become a hedgehog fugitive. As an example, here is California's take on the matter. Depending on your state, your results may vary. 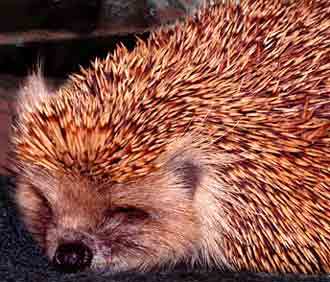 When obtaining a hedgehog as a pet, it is best to buy from an experienced breeder. Turns out the little critters need to be domesticated. Reputable breeders will do that for you before selling them. Prices could range up to $200 for your young, healthy, fully domesticated hedgehog. And another note about the crime aspect. It turns out that hedgehogs also happen to be a culinary item. So, if the wrong people start to become suspicious of your hedgehogness, you can always eat the evidence. Btw, most cities require one to pay a fee for a pet license; and that's for any pet: cats, dogs, rabbits, you name it. Now if you go down to City Haul to pay the legally mandatory pet fee for your hedgehog, it will probably really hit the fan. Frankly, I'm deferring on becoming a hedgehog criminal; life is complicated enough as it is.